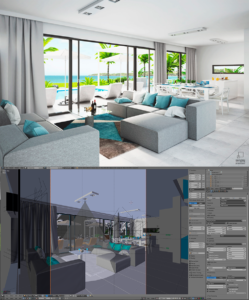 From all the articles that we post here in Blender 3D Architect, we have special care with our interviews. 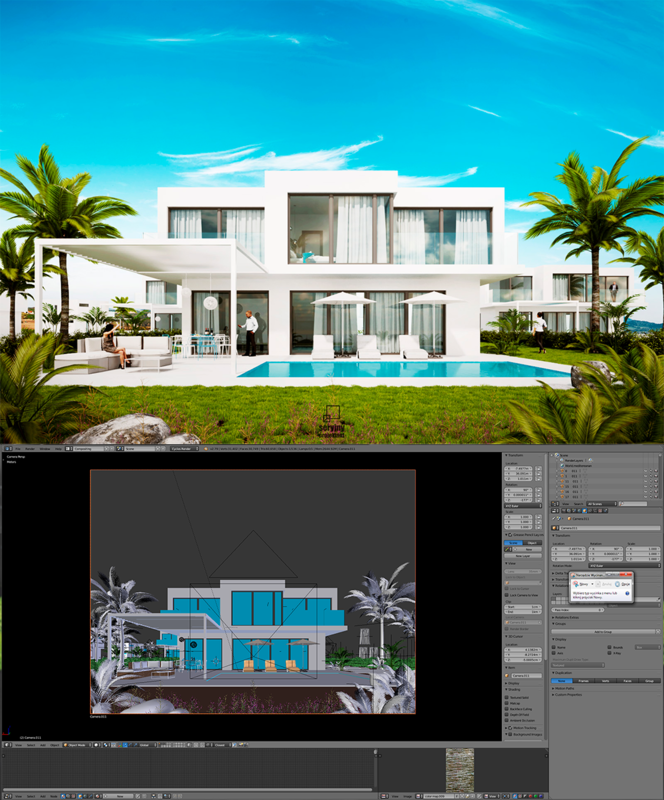 In those interviews, we try to reach talented artists that use Blender to create an architectural visualization. Today we have an interview with an inspiring artist from Poland called Paulina Kochanowicz. She runs the visualization studio Seryjny Projektant, and has an impressive portfolio using Blender and Cycles for their projects. For each project in which Paulina Kochanowicz shares on their site, you will see an impressive level of quality and also quantity. 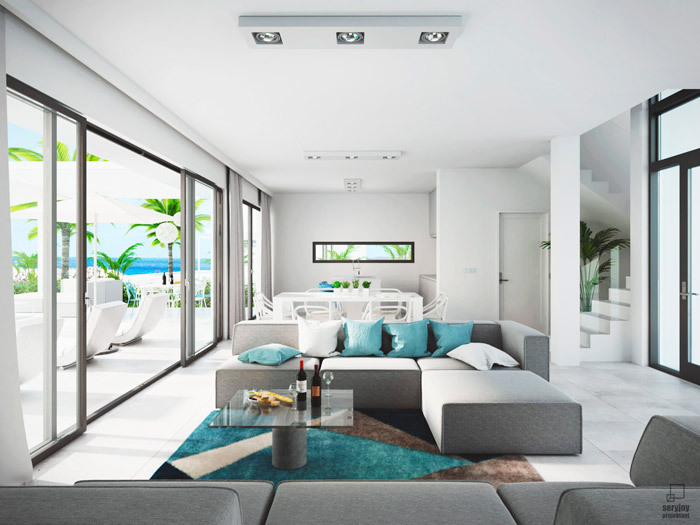 The projects always feature several exteriors and interior views, keeping the same level of realism. 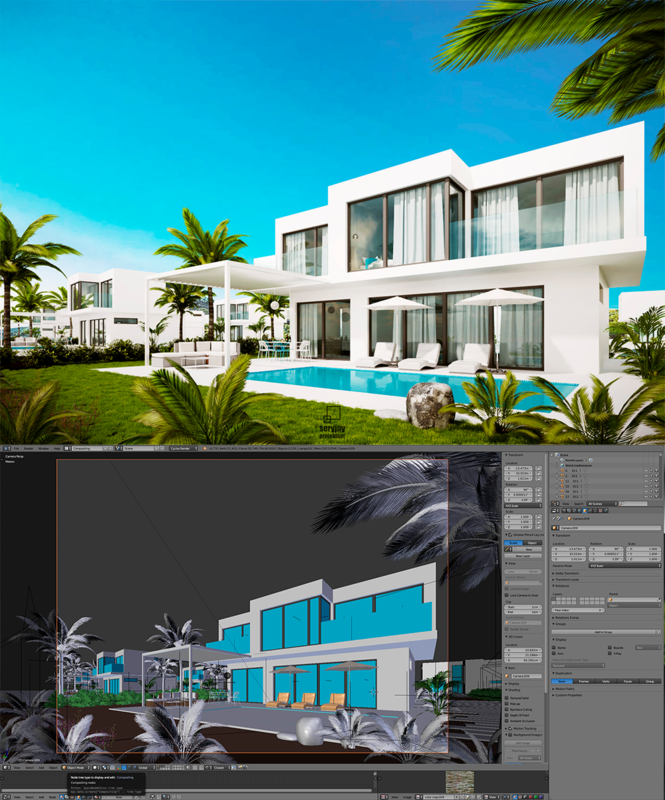 We reached her for an interview after seeing a project of a house in Tenerife, which appeared in the BlenderArtists forums. In the following interview, we will address this particular project. Before we start the interview, let me thank Paulina for participating in the interview and sharing some screenshots of the project in Blender.  1 – For how long you have been working with architectural visualization? When I started learning Blender, there were not as many tutorials available as it is now. The very first thing I modeled and visualized in Blender was a block of lego 🙂 I watched a French tutorial, and I must add that I do not know French at all. It took me two days to make this block of lego 🙂 Cycles wasn't available at that time, as I remember correctly, so I made the first render in the internal rendering engine. Then I learned Yafaray and the first visualizations of interiors from this engine went out very well. Then I completely switched to Cycles and this engine now renders all my visualizations. 2 – Why do you use Blender for your projects? There are many reasons why I use Blender. First of all, it is quite easy to use. It is very well developed. It is ideal as a tool to visualize every concept, from packaging of food and other products, through visualizations of interiors, to visualizations of architectural and urban planning concept. It has a large and helpful community. The great advantage of Blender is Cycles, which is constantly growing. I hope it will continue to be so. The addition of denoising in recent versions is a hit, the rendering time has also improved a lot. Blender is compatible with many software – I use ArchiCAD, sometimes Sketchup, and then import a raw model in .obj or in .3ds into Blender. 3 – Congratulations on the Tenerife – Housing estate project. How long did it take from start to finish? From the day you received the project to final delivery. Thanks Allan. With commercial visualizations, the time is always the key. I rarely have a lot of time to develop a visualization. Most projects are to be done “on yesterday”. 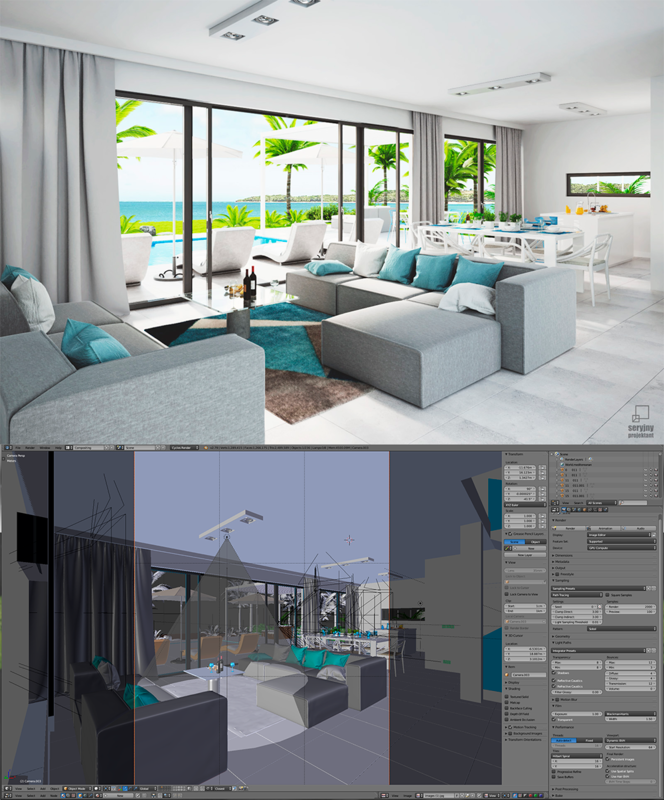 All visualizations for Tenerife housing were done in 2 weeks. 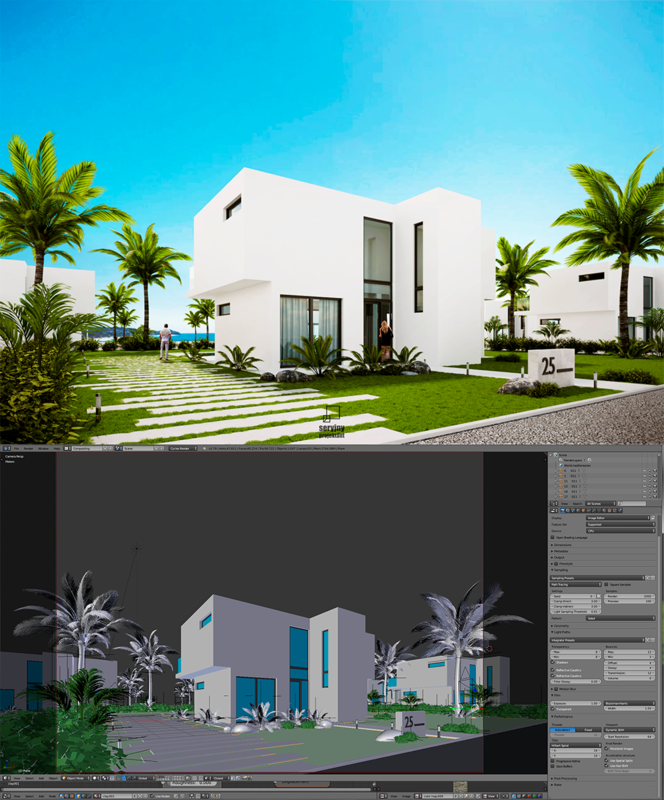 4 – Rendering both interiors and exteriors was a goal from the beginning? Do you work on them at the same time? Yes. In architectural projects, when there is not even a hole in the ground, the most important thing is the picture, because it sells the investment. So yes, from the very beginning the order included visualizations of the interior and exterior. I worked on the inside and outside simultaneously. When creating more complex projects, like this one, it is important to have a moment of breathing from the made trial visualizations. That's why I tried to do these visualizations in a different way. When I was “tired” of external modeling, then I dealt with the interiors. 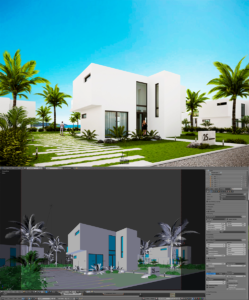 5 – Do you make separate models for interior and exteriors? 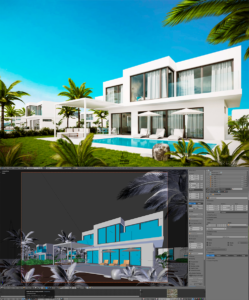 My workflow looks as follows – I get blueprints from the client, I import them into Archicad and make a simple model, from which I also have technical drawings. Then I put the model in Blender and, where it is needed, I correct it. The models that I use for interior visualization have quite a complex geometry, which means they weigh a lot. So that the whole scene does not weigh too much, I divide the interior and exterior into separate files. And if I render different interiors or different elevation shots, then I hide the elements invisible to the camera to layers that are not rendered. And if I render different interiors or different elevation shots, then I hide the elements invisible to the camera to layers that are not rendered. 6 – Did you use any technical drawing as a reference for modeling? It depends on the client. Sometimes it happens that I get complete building documentation, cross-sections, elevations, etc.. Sometimes it happens that I work even on an ordinary sketch, and sometimes without anything because the client counts on my creativity. With this project, I received only simple blueprints and elevations from the client. The interior design I made by myself. 7 – Is there any post-processing applied to the renders? I always try to prepare visualizations so that they require as little postproduction as possible. In photoshop I only made a delicate color correction – I strengthened the contrast and added the sky and people. 8 – Can you share with us the hardware you use for your renders? I thought it was just me who double read that line.